Suturing under laparoscopic conditions also produces other influences on the choice of suture materials. Surgical knots must hold and the choice of a woven or monofilament, absorbable versus nonabsorbable suture must be carefully chosen with this constraint foremost. 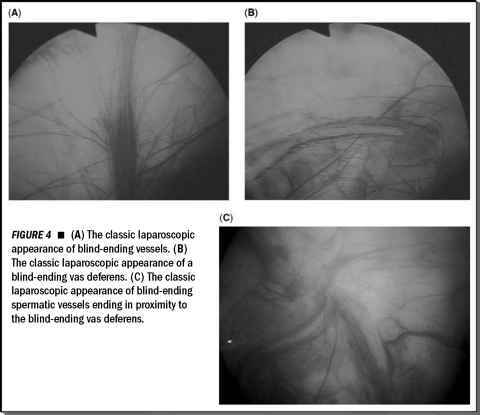 For urological applications, intracorporeal suturing with plain or chromic gut and polydioxanone has advantage of allowing secure half hitch throws. Unfortunately, the coloring of each of these suture materials is such that if blood is present at the laceration site, specifying the ends, crucial for the orchestrated movements already discussed, becomes impossible. Blood has a tendency to adhere to these suture materials and strict attention to hemostasis is warranted. In addition, the coloration absorbs the light in all these materials except for the blue PDS™ (157). Because multiple untied sutures are placed but not tied as is required for complex end-to-end anastomoses, swage and tail ends become indistinct (Fig. 32; left). Brightly colored, optically fluorescent colors are required to overcome this problem. Currently, dye materials that have been investigated to enhance visibility when exposed to xenon light have also demonstrated carcinogenic properties. Despite this, colors most efficacious for laparoscopic suturing include pink, yellow, green, and purple (Fig. 32; right) (151). The next problem for intracorporeal suturing is introducing the correct length of suture material. Available endoscopic suture materials that come prepackaged have no conception as to the requirements of the surgeon for the given task. Therefore, the sutures are often long (greater than 80 cm). For a simple stitch, the length required should be no more than 13 cm for a surface knot or 15 cm for deep stitches (158). Running sutures are more difficult to approximate, but as previously mentioned, a rule-of-thumb is to utilize approximately twice the length of the incision (159). Keeping the length to the minimum required results in less surgical frustration in manipulating long tail segments.